The clear water of Langebaan Lagoon is surrounded with white sandy beaches. Protected Lagoon waters and a mild climate makes this the perfect place for fishing, kitesurfing, kayaking and numerus other water sports throughout the year. Langebaan also offers a wide range of holiday accommodation facilities and is very popular during school vacations, Easter weekend and especially November – January. AEGEAN HEIGHTS SECURITY ESTATE is in Langebaan on the West Coast off the R27. The Estate is dramatically located on its own private headland within the Club Mykonos parameters offering stunning, uninterrupted views of the Atlantic. Only a few steps from the Ocean and on a gentle slope in three tiers guaranteeing a lifetime of “to die for” Ocean views. It is undeniable that what you see today will be there tomorrow, stirring ocean vistas and breath-taking sunsets. Aegean Heights Estate was created for uniquely designed homes that offers enhanced coastal living in what can only be described as a beautiful West Coast environment. The inspired designs of Aegean Heights have ensured that you may enjoy the maximised benefits of this superb location, providing privacy, sea views, space and light. Here one can enjoy 24/7 security including regular security patrols, full use of resort facilities and much more. PARADISE BEACH SECURITY ESTATE is an Exclusive Security Estate situated on what is known as one of the best positions the West Coast has to offer and can be found in the region of Langebaan. The landscape here is shaped in a cove protecting most of the Homes from the wind. This beautiful cove with its white sandy beaches stretching for kilometres accompanied by a long boardwalk is home to some of the most breath-taking Greek style homes in Langebaan. Bordering a reserve area, you can enjoy nature walks, hiking, jogging and cycling amidst the beautiful fynbos and wild life, also visit the popular hang gliding launching spots on the sand dunes leading right up to the shore. For a bit of family entertainment and fun Club Mykonos Resort and Casino is situated 5 minutes’ drive from Paradise Beach and you can enjoy all Resort facilities such as mini-golf. Paradise Beach offers stunning sea views and the sound of the waves can be heard from your bedroom. It is a serene location that truly transports you to Greece. APOLLO RIDGE is a small but well known and Exclusive Development within Club Mykonos Resort and Casino. Building guidelines are in place to maintain the standards of the development. It is walking distance to the Mykonos Marina offering a variety of sea side restaurants and loads of entertainment throughout the Resort. Apollo Ridge offer the full use of resort facilities and is the perfect break away from everyday life with its Greek style homes and the white sandy beaches close by. CALYPSO BEACH SECURITY ESTATE is an Exclusive Security Estate ideal for those looking for something different in terms of style and community. Calypso Beach is comprised out of 338 home owners who either own vacant land or completed homes. 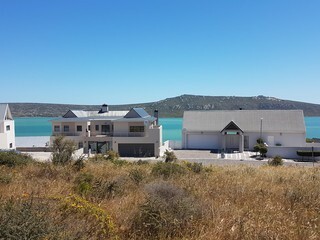 This is an upmarket area of Langebaan with a unique Tuscan style look and feel. It offers 24/7 security patrols with one security boom entrance and exit. The development is situated right on the white sandy beaches and facing West with beautiful views of the Atlantic Ocean and Langebaan Lagoon accompanied by stunning sun sets. This location makes it easy for any Calypso Beach Home owner to walk along the beach to their neighbour “Club Mykonos Resort and Casino” where you will find numerus restaurants right on the waters edge creating the perfect atmosphere for a sundowner or dinner with the family. BLUE LAGOON SECURITY ESTATE is one of Langebaan’s most well sought-after and popular Estate’s offering top of the line security and Exclusivity. With a Unique building style to maintain the standard of development of the Estate, thus making Blue Lagoon the perfect Estate for those looking to become part of a safe and secure community that offers modern West Coast living. Blue Lagoon Security Estate is Approx. 2kms drive from the Laguna Mall, Curro Private School, Filling Station and the World-Renowned Club Mykonos Resort and Casino and a short walk to your nearest beach that offers crystal clear waters and a stretch of white sandy beaches. Blue Lagoon promises to take you away from your day to day worries and transport you to your very own luxurious and secure living environment. CLUB MYKONOS RESORT & CASINO is “A Little Piece of Greece on the South African West Coast”. It is located on the serene shores of Langebaan offering scenic views of the Bay, Lagoon and Atlantic Ocean. One of the most popular holiday destinations on the West Coast, it offers family friendly entertainment, conferencing facilities, water sports a games arcade for the kids, state of the art Gym for those who are more health and fitness inclined and a heated indoor swimming pool. The Resort can accommodate large numbers of visitors annually. Annual events, fund raising, exhibitions and festivals are also hosted here. Among the accommodation options are the Terraces, Athenian Cascades and the more Elegant 4 Star accommodations. Club Mykonos Resort and Casino will deliver you to your very own piece of Greece. SKIATHOS is a well sought after residential area right on the doorstep of Club Mykonos Resort and Casino. This Area has a unique building style and look giving the area a uniform look throughout. It is a pet friendly area and no monthly levies are payable and Skiathos is also very popular during the weekends, Easter weekends and peak seasons. People come from far and wide to rent holiday accommodation in Skiathos and enjoy all that Langebaan and Club Mykonos has to offer. Owning property in Skiathos is a great investment opportunity. SANTORINI SECURITY ESTATE is well positioned opposite the newly renovated Laguna Mall in the well-known holiday town of Langebaan just of the R27 on the West Coast, walking distance from Curro and Longaceres Private Schools and offers a fantastic security investment opportunity. A small, but popular Estate offering affordable housing close to all amenities. Just a 5 Minute drive to the World-Renowned Club Mykonos Resort and Casino that boasts loads of entertainment for the whole family. LAGUNA SANDS forms part of the Langebaan district and is within close proximity to Club Mykonos Resort and Casino, Laguna Mall, Filling Station, Curro Private School, Longacres Private School, Newly built Private Day Hospital / Medical Clinic and much more. Laguna Sands Estate is a secure and exclusive residential Estate, it is pet-friendly and located in a modern West Coast setting. New owners to this Estate will be assisted by designer Carla Du Preez in creating their dream home on the West Coast in this modern Estate surrounded by an abundance of bird and wildlife as well as jogging, cycling and walking/hiking trails. This Estate is also just a 10 min drive from the well-known 18-hole Gary Player designed Black Night Golf Course. Hot Summer day can be spent on the white sandy beaches of Langebaan offering crystal-clear waters. While each home is unique it follows the building guidelines of the Estate to maintain the standard of the development and it also provides an effortless flow through the entire Estate to reflect the modern West Cost living environment of Laguna Sands Estate. LONGACRES COUNTRY & EQUESTRIAN ESTATE is perfectly suited for those looking to stay connected or get in touch with the wild life of Langebaan while enjoying a farming lifestyle. Approx. 120 km’s north of Cape Town, properties in this country estate range from 2ha – 2.5ha and offers land owners the opportunity to farm, run a guest house or provide rental / holiday accommodation. A 5-minute drive west will bring you to the popular and well-known Club Mykonos Resort and Casino offering loads of entertainment and restaurants to be enjoyed. Longacres Country Estate is located approx.… 1,5 km’s from the Atlantic Ocean, Bay and Langebaan Lagoon. No need to worry about shopping for necessities as the newly renovated “Laguna Mall” is situated close by. Driving to Cape Town to get to your closest hospital is a thing of the past as Langebaan now has its own Private Day Hospital and if that does not suit you a 15-minute drive to the town of Vredenburg will take you to a 24/7 Private Hospital, Curro Private School is not too far off either. Longacres Country Estate also gives many residents the chance for small scale Cultivation, some of which include grape vines, olives and vegetables. It is not uncommon to find yourself looking out the window and seeing a tortoise, duiker or steenbok grazing across the property as the Estate is a conservation area as well. Some owners keep horses, sheep, camels or even some springbok. In conclusion, Longacres Country & Equestrian Estate is a nature lover’s paradise close enough for commuting but far enough for peace, quiet and relaxation. OLIFANTSKOP development can be found just a mere 800 meters from Club Mykonos Resort and Casino and only 200 meters from the newly renovated Laguna Mall. Close by you will also find a filling station, Curro Private School and various other West Coast Shops. Oliphantskop offers many small holdings, some with already existing homes and others are Vacant Land. These Small holdings with their unique granite outcrops, scenic hills and beautiful scenery make for a truly magnificent West Coast experience. Oliphantskop boasts a wide range of various styled Farmsteads, it is here one can stay in touch with nature and experience the charm of the West Coast Architecture. As always, the Crystal clear protected Lagoon waters and white sandy beaches are only 5 minutes’ drive away. SUNSET ESTATE is an Exclusive Security Estate to be found in the popular sea side holiday town of Langebaan on the West Cost and gives you the opportunity to be part a safe and secure community with a single entrance and exit boomed gate along with 24/7 security patrols. Sunset Estate also provides a Unique building style that you won’t find anywhere ells in Langebaan, thus making it one of a kind. The Estate also borders the Langebaan Country Estate (Golf Estate) which brings to the table some of the most beautiful wild life scenery in Langebaan. Border and Estate patrols are performed regularly, and this small but outstanding Estate is just a short walk away from the white sandy beaches and crystal-clear waters of the popular Langebaan beaches. WATERFRONT SECURITY ESTATE is an Exclusive Security Estate offering 24/7 security patrols and a single entrance and exit point fitted with an electric gate. This Estate is surrounded by the Estates of Calypso Beach Estate, The Cove, Blue Lagoon Estate and Sunset Estate. Located in the West Coast town of Langebaan, here one can expect to be part of a friendly community and own or create one of the Uniquely Designed Waterfront homes. Walking distance from the white sandy Langebaan beaches were the whole family can enjoy leisurely walks and swimming on the beach in the cool Atlantic sea waters. Waterfront Estate offers you a modern and secure living environment with all amenities close by. THE COVE ESTATE is another one of Langebaan’s gems, a well sought Estate situated right white sandy shores accompanied by the crystal-clear waters of the Lagoon. A 5 Minute drive will bring you to the World-Renowned Club Mykonos Resort and Casino, Laguna Mall, Curro and Longacres private schools and much more. This Estate has a unique building style and look giving the Estate a uniform look and easy flow throughout. It is a pet friendly Estate and walking distance from the beach. The Cove is made up of holiday homes and permanent residents and is also very popular during peak seasons. The Cove Estate offers you the chance to break away to your own slice of paradise. LEENTJIESKLIP CARVAN PARK situated in Langebaan on its white sandy shores accompanied by the crystal-clear waters of the Lagoon. Leentjiesklip is one of Langebaan’s three caravan parks and surly its most popular offering plenty of camping spots with electricity, bathroom facilities and a tuck shop for your camping essentials. Furthermore, Lientjiesklip also offers pre-fab cottages for those who like to camp in style and not huddle-up in a camping tent. There are loads of activities to be enjoyed by the entire family and the opportunity to just lay back and enjoy some rest and relaxation. LANGEBAAN NORTH as the name suggests is in the northern suburbs of Langebaan on the West Coast of South Africa. This area is known for is amazing sea and Lagoon views along with its popular white sandy beaches. It is home to one of Langebaan’s three Caravan Parks and offers affordable housing, elegant and unforgettable West Coast holidays. With this well sought-after area of Langebaan being walking distance from the beach it is sure to accommodate you with comfortable sea side living with the sound of the Ocean sweeping in your ears. LANGEBAAN COUNTRY ESTATE (GOLF ESTATE), situated in Langebaan on the West Coast, was, from the very beginning meant to offer visitors and residents alike an exceptional living and environment. Well guess what, this magnificent 450-hectare Country Estate did just that with a jaw dropping setting right next to the renowned West Coast National Park with its protected 17 km long Lagoon waters, sand dunes and stretching all the way to the next West Coast town of Yzerfontein. Langebaan Lagoon is considered by many to be, perhaps the most beautiful Lagoon in Southern Africa and for most a special place in a stunning picturesque location. At the heart of the West Coast lays this well-known Langebaan Country Estate home to the West Coast’s only 18-hole, Gary Player Designed, Black Night Golf Course as it is known to many. Offering the perfect balance of leisure, sport and conferencing facilities accompanied by spectacular West Coast scenery. The Langebaan Country Estate boasts a wide variety of indigenous wildlife and prolific birdlife and is also environmentally friendly and known to be a non-polluted Estate. The Estate is complimented by the natural Fynbos and Renosterveld vegetation and is home to one of the largest varieties of tortoise species in South Africa. In the Langebaan Country Estate, you can own exclusive yet affordable property. Whether you’re planning a celebration, a round of golf or just a bit of rest and relaxation you will find it all within the Langebaan Country Estate and the white sandy beaches and crystal-clear waters of the Langebaan Lagoon is not far off. LANGEBAAN MIDDEDORP/MIDTOWN is where it all began, this is where this outstanding holiday town took root. This suburb offers some of the most unique homes as well as Luxurious B&B’s and Backpackers are all to be found in this area. It offers visitors and residents alike to opportunity to take a leisurely stroll to the beach with the entire family, including the Dog, where you can also find the Kite surfer’s hotspot. Langebaan’s white sandy beaches are to be thoroughly enjoyed in this suburb and is also home to the very popular “Pearly’s on the Beach” and “Driftwoods” Restaurants. For the happy camper this area offers camping facilities in on of the three caravan parks in Langebaan. Langebaan Middedorp is also close to Sunny Park where the kids can enjoy a day of fun in the sun and you will find yourself close to all amenities. Make no mistake, Middedorp offers some of Langebaan’s most precious gems in terms of accommodation and cuisine. LANGEBAAN COUNTRY CLUB is a peaceful, well sought after and Safe Residential area, it borders on the Langebaan Country Estate (Golf Estate) and offers a unique Country like feel look. Winding through the Country Club you will find the Langebaan Mashie Course offering kids and adults alike the opportunity to enjoy a bit of family Golf. The Langebaan Country Club (Not to be confused with the Langebaan Country Estate) boasts many modern newly built homes with a fresh look and open flowing feel as well as many of the older homes too. Here you can enjoy a country lifestyle with friendly neighbours and top-class security from various security agencies in town and continuous security patrols creating a safe and enjoyable living experience for the entire family. MYBURGH PARK is a peaceful, well sought after and Safe Residential area, it borders on Farmland giving you a fantastic view of the Langebaan Fauna and Flora. Myburgh Park is situated at the far end of Langebaan right next to the West Coast National Park, filled with hiking, walking, biking and jogging nature trails and offers a modern feel and look making this one of the most sought after residential areas in Langebaan. With the Myburgh Park landscape steadily sloping at an incline, most of the homes here enjoy beautiful sea views. It is a safe and pet-friendly area making the perfect area/suburb for your entire family. Here you can also enjoy a modern lifestyle with friendly neighbours and top-class security from various security agencies in town and continuous security patrols creating a safe and enjoyable living experience for the entire family. Myburgh Park is perfectly positioned to take full advantage of all the Langebaan Lagoon offers and is only a 5 min drive from the Langebaan Yacht Club. PENGUIN PLACE you will find located right next to Panorama in the Coastal holiday town of Langebaan. Stretching a mere 0.26 km’s in length and walking distance from the Langebaan Yacht Club. Close by you will also find the popular and historic 4 Star Farm House Hotel including various hiking routes to be enjoyed. It is from this modern, safe and secure area that you will find some of the best Lagoon views in Langebaan. Penguin Place might be small in comparison to other Estates and areas in Langebaan but dishes up some of the biggest and best Lagoon scenery, creating a true West Coast ambiance accompanied by comfortable Luxurious living. CHURCHHAVEN & KRAALBAAI is situated in Langebaan Lagoon on the West Coast off the R27, it is a small but beautiful little fishing village. Here you will find examples of restored white-washed fisherman’s homes amongst the more modern homes having made use of a similar style. Churchhaven finds itself in the perfect position right next to Posberg which is within the parameters of the Western Cape Nature Reserve and only opens up to visitors a certain time of the year (August – September) and dishes up a magnificent sample of the Namaqualand spring flowers. The Reserve offers the two-day Posberg hiking trail exploring an incredible coast line of beaches. From here the West Coast National Park is right at your doorstep about halfway between Yzerfontein and Langebaan.